Having 15 days to memorize is going to make the months fly by because I cant believe we're into the 2nd verse. My first verse was so appropriate for the time in my life... "DONT PANIC... I AM WITH YOU...."
It was the best scripture I could possible keep in my heart. Ever have someone say the perfect words to you? Maybe they were simple words... but they helped you... they soothed the pain... they comforted? Great words. 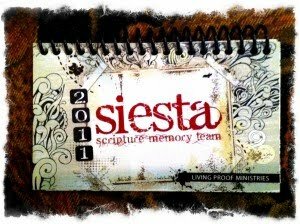 I'm participating in the Siesta Memory verse too. Think I'll copy you and make a post about it too. Who knows, maybe it will encourage someone to hide some scripture in their heart. Our words (tongue) can quickly build up and tear down in the same amount of time. That is a great verse to remind us to use our tongue and our words to edify and uplift others rather than hurt and cut them down. Love your verse this time RJ! Wow. Wow. Wow. That is a good verse. I could definitely use some wisdom in my words sometimes. GREAT Scripture!! I need to put mine up on my blog. I can't believe we are in round 2 either! Loving it! Excellent. Something we all need to remember.